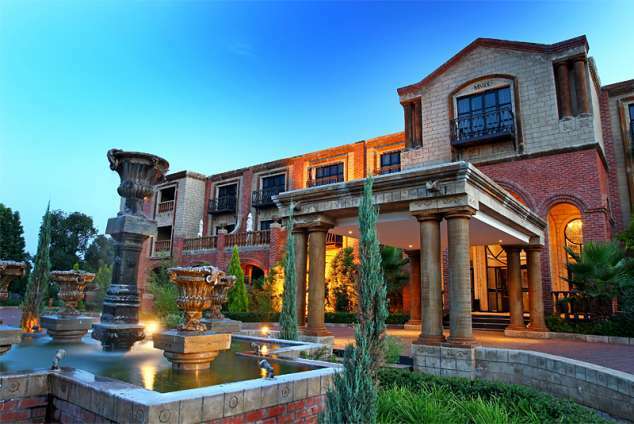 Velmore Hotel Estate - Centurion Accommodation. Velmoré Estate consists of the Velmoré Hotel, a stunning establishment aimed at the affluent luxury market. The property also features a second hotel, the Velmoré Grande - the Grande is the ultimate in luxury and opulent excess, from its oversized rooms to its extravagant finishes. Velmoré is ideally located between Pretoria and Johannesburg. These two luxury hotels have a tranquil country setting that borders the Hennops River, and offers spectacular views of the Magaliesberg Mountains. Its unique architecture is nostalgically inspired by traditional French Provence, and the layout of buildings over the expansive landscape creates a sense of space and serenity. After the sun sets, the ambiance transforms into one of magic and romance, with its atmospheric lighting, elegant archways, fine dining and exquisite décor. The hotel can cater to large corporate events, product launches and stage shows, weddings and celebrations - no event is too big or small. Velmoré offers the perfect weekend getaway close enough for convenience, but far enough to escape. The hotel prides itself on its elegant accommodation, attention to detail, service that matters and exceptional culinary experiences. Our Standard Rooms offer a warm classical feel and offer tea/coffee station, mini bar (stocked on request), air conditioning, and en-suite bathroom. Our Luxury Rooms deliver an elegant and classical feel on a larger scale; the room is more spacious and features tea/coffee station, mini bar (stocked on request), air conditioning, en-suite bathroom, and private lounge. Note: Velmoré Hotel does have disability-friendly standard rooms. Our Standard Rooms are a cut above and clearly stand out as a luxurious and opulent offering; the rooms have been designed and finished in a modern and contemporary feel to meet the demands of our discerning clientele. The standard rooms all feature, tea/coffee station, mini bar (stocked on request), air conditioning, and en-suite bathroom. Our Luxury Rooms set a new standard for space and elegant opulence; the rooms have been designed and finished in a modern and contemporary feel to meet the demands of our discerning clientele. The luxury rooms all feature, tea/coffee station, mini bar (stocked on request), air conditioning, en-suite bathroom, and private lounge. The Presidential Suite is a one of a kind that has been designed to meet the needs of discerning customers from around the world offering unparalleled elegance and sophistication this unit has been used by CEO’s, foreign dignitaries and celebrities alike. Each individual room in the presidential suite has its own air conditioning, big screen television, spacious en-suite bathrooms and luxurious finishes. The Ample Suite incorporates a bar facility (stocked on request), preparation kitchen, and stylish entertainment areas. Note: Velmoré Grand Hotel does have disability-friendly Standard Rooms. A memorable experience awaits you at the Hotel’s Restaurant, from the stylish décor to the sumptuous dishes, soft background music and tempting menu selection, all your senses will be tantalized, no matter what the occasion, dinner for two, a celebration or an anniversary. At Velmore' we offer conference & event organisers the opportunity to create extraordinary events with our versatile venues and wide open spaces. With multiple indoor and outdoor locations Velmore plays host to any event, from smaller intimate weddings to huge corporate functions. 1574 page views since 01 Nov, 2017. Last updated on 08 Apr, 2019.